Do Cat Owners Actually Beach Their Cats ? Location: Boat - Bahamas and for SALE!! Re: Do Cat Owners Actually Beach Their Cats ? Since it was an eye witness I talked with (my friend), I would call it a 1:st hand story. Of course my friend could be mistaking or just lying, even though I have no reason not to believe him. What other people think of the story I really don't care, but it might be a clue that FP recommends to have extra support when on the ground and specially if walking on the bow. Maybe that was what happend with that FP. Still, looking at the keels on the FP:s I have seen, they look quite short and with sharp corners, which doesn't feel strong enough. No problem Tolly. What happens is your friend was first hand, you are second, and we are third - which is a long way from first - ya know what I mean? Having received this info straight from FP I can say this - I'll still avoid putting all the weight on the keels. What it may not take into account is the weight of the generators, extra diesel tanks, etc. I would conservativily estimate that Palarran weighs 8 to 10k lbs more then it did at the factory. If the blocking isn't perfect that would be a lot of point load. And if there is a rock 2" below the sand that it's beached on? Could be trouble. Regardsless of this I leave this discussion now and let you continue with it, happy that I don't really have to worry about the issue. 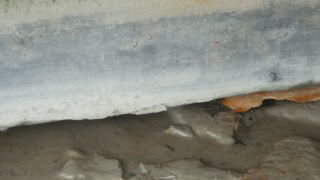 I am also looking at installing a V under the bridge deck to reduce slam from the small Gap there is under there. Last time it was the other hull that broke, and since the boat was pretty new, FP payed for fixing it. Didn't know how it would be this time. The later explanation was that the FP:s are not strong enough built to stand on their keels without extra support. If FP paid for the fix, says to me that not meant to do that - and if other owners have not regularly been breaking keels / punching through then FP probably right. Maybe that boat was built on a Friday? (or had a hard landing(s) from the hoist?). Nothing is indestructible and if your not careful you may find this out the hard way- again! Like so many stories that are second hand the "story " Tollys friend told him sounds like the old fisherman’s tale of -Fish are the only animals on the planet that continue to grow after their dead. Each week after the fish was caught and eat the fisherman retold the story and it gained 10 pounds each time the story was retold- 20 pounds each time others retold it! I understand and that time could be ...anytime! Whilst I have never been one for taking what folks say as gospel, many things do go into the pot - at least for future consideration. In this case, if spending $250 or $500k I would consider it prudent to at least consider how sensible an action was before doing it. FWIW I do have a long history of simply giving things a punt - and events not always going as intended / hoped for ......so not averse to the principal. How much thought is, as always, a matter of personal choice . Ram is probably right, every kg that you add while trying to beef up any boat needs to be offset by a reduction of weight somewhere else or you will end up with less clearance than you already have. Probably better to accept the Gemini as it is,it does a lot of things very well and some things better than most cats like fit in a marina berth and haul out with any travelift. 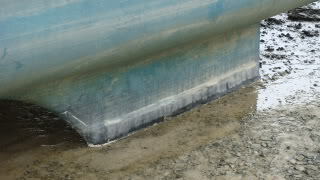 One thing that hasnt been mentioned is that structurally daggerboard and centerboard multis have tremendous strength imparted by their trunks which is right in the area where they sit on the bottom, the only problem is that not having that mini keel is it it harder to work on the bottom when on the beach as well as of course the sharp rock problem. I was on a Gemini recently that had had previous repairs done a few feet ahead of the trunk which was probably from a point load. We have a Fountain Pajot Lipari it sits on its keels which are also sacraficial. I have been to the factory and the stand on their keels and come with instructions on where to place timber supports if you stand them on their keels on the hard.I have photos of all their cats standing on their keels but I don't know how to attach a photo. I'd like to see the pics. To post click on the Post Reply tab at the botton of this page and then it will open up the Reply to Thread window. On the top of that window is a paper clip which will open a window which will allow you to browse through pics on your computer. Click on the ones you want then click upload and there you are. 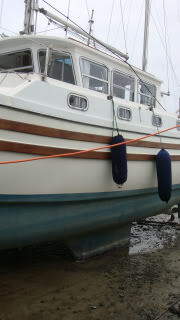 I am building a plywood 40' Snell Easy cat, and am currently working on the keels. The boat is designed to sit on the keels, and I am concerned about the abrasion that has been discussed. What about fitting a "shoe" to the bottom of the keel? The keels are timber and epoxy coated, and I am thinking of taking them to a metalworker to have 316SS shoes made up now in 5mm plate, before the keel is fitted. Would be real shame to throw away all your hard work, even if that was a long term thing (and likely the problem of a next owner). My answer would be to add something to the bottom of the keels, the question would only be what. I certainly think that now (whilst still building) is the best time to address this, if you decide to. If not simply layers of (sacrificial) fibreglass I would personally also look for something that could later be removed and replaced (without chopping the keel(s) off!) - even if unlikely that it was you who would be doing that......but you never know! In addition to the methods previously mentioned, have also seen folk using simple wood (hardwood) on keels as sacrifical strips albeit that mostly on smaller vessels (might be done on larger boats, just have never seen it). One thing to bear in mind is if fixing via screws (or bolts) from underneath that can be source of water ingress, plus the heads are first thing to wear off!....have seen a few boats over the years where the keel bands dropped off! Yesterday I took a few snaps of a Catamaran that was parked a couple of boats along. Appreciate that a Catfisher is not exactly a performance boat!, but this is what has been done (no idea how old the keel bands are, but she has been a drying mooring as long as I can remember). The bar has been fixed on using simple welded on tangs (look closely and you can see the bumps) - possibly thru bolted (the usual MO) - and then glassed over. A couple of of other Multihulls in the harbour (including a small(?!) Lagoon) - but they live in the muddy bit, so I won't be wading through the mud just to snap some pics! But I do that on occassion, so might snap some pics - if I remember . Would it be worth the effort and the $1000? IMO, if beaching is intended on a regular basis (rather than occassionally to antifoul etc, in carefully chosen places) then I would. But I ain't claiming to be an "expert". This on a Wood Mono (keel is solid hardwood, dating from late 60's) - fitted around 20 years ago (by my Father - boat long since sold, to a succession of idjuts ), that would have been at least 1/4 inch steel bar. Obviously rust would have played a part in it's present condition - but more about having been beached twice a day (drying moorings over here). My boat is a mono hull but is made to be beached. Really made for the tides in England has retractable keel so it will sit straight up. I have beached it a couple times its fun watching the other crews as we go aground. Check out the Southerly's.